Albany, NY – December 4, 2018 – Today, Blasch Precision Ceramics, Inc. announced that it has signed an agreement with BD Energy Systems, LLC of Houston, Texas granting exclusive rights to market and sell the Blasch StaBlox™ Reformer Flue Gas Tunnel System into ammonia and methanol synthesis gas production facilities worldwide. With this agreement, the two companies will collaborate on advancing their innovative technologies and strategically addressing global market opportunities. Together, Blasch’s patented StaBlox and BD Energy’s patent-pending Tunnel Optimal Performance (TOP) flow controlling tunnel technology offers a significantly improved and differentiating technology to the market as compared to traditional solutions. Additionally, the solution provides significant process improvement, much faster and simpler installation, and a more robust, mortar-free structural tunnel system to plant operators. Recent installations have substantiated the value proposition, and market demand has been steadily increasing. Founded in 1979, Blasch Precision Ceramics, an Albany, New York-based manufacturer, provides innovative solutions for the world’s most challenging refractory applications. Blasch produces premium quality, net shape refractory ceramic shapes and systems for a variety of manufacturing and process industries throughout the world, including aerospace metal processing, chemical processing, petrochemical refining, power generation, non-ferrous metal processing, industrial process heating, mining, minerals processing, cement and wear. Visit the Blasch Precision Ceramics website to learn more. BD Energy Systems has executed more than 130 successful projects on Ammonia, Methanol, Hydrogen and Refinery plants of various designs. The range of projects covers steam methane reformers, secondary reformers, boilers, burner replacements, selective catalytic reduction (SCR) systems, selective non-catalytic reduction (SNCR) systems, combustion air preheater systems, and many more. Visit the BD Energy website to learn more. Blasch’s patented StaBlox Flue Gas Reformer Tunnel System is a versatile, mechanically stable system consisting of a series of stackable, mortar-free interlocking blocks. 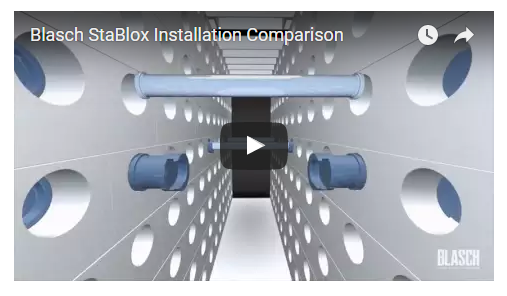 The StaBlox system allows for an extremely fast, easy installation as compared to conventional brick and mortar designs, while at the same time offering a much higher level of reliability, greatly enhanced speed of tunnel construction, substantially reduced downtime and lower overall installation cost. Through computationally modeled and designed tunnel orifice inserts, BD Energy Systems’ patent-pending TOP technology can be implemented to provide near uniform flow along the length of each tunnel, promoting even heating and reducing tube hotspots.